The heights of trekking is not achieved in life, unless the die-hard does not attempt the Everest High Pass Circuit Trek in ones life time. The trek is done in virgin glaciers, jagged tortuous trails, valleys of sparse settlements and ancient passes used by some who first broke the boundaries of human civilization. The trek is all done in the Khumbu region with a bird’s eye and bewitching view of some of the highest peaks in the world under the inhabitants – the local Sherpa Community who have for centuries made it their home to guide and inspire you on your conquest of your inner-self. The trek thought arduous, takes you past boulders and flattering flags with inscribed prayers, soaring up to the peaks in reverence giving you the sense that each part of nature is so intricately linked to human endearment. Each valley, glacier, pass and forest you pass seems to have its own legend and myth secretly telling you to carry on. 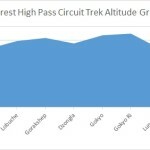 The Everest High Pass Circuit Trek begins immediately on your landing at Lukla from where you hike down a twisting trail with boulders and fluttering prayer flags beckoning and welcoming you on to Namache Bazaar the capital town of the Sherpa Community passing the hamlet of Padking. Here you get two days to acclimatise to the altitude but not in boredom. You get to explore the local culture and serenity. You first day’s trek is to Devuche and then onto Dingboche. Here you need to acclimatise again with a side trip to Chukung Ri (Ri is small peak in the local dialect) used as a summer settlement. The next leg of the trek takes you to Lobuche and from there, it is onto Everest Base Camp where one gets to see the awesome height of Mount Everest and the camps of those aspiring to conquer it. The following day it is Kalla Pattar and Gokyo ( famous for its five freshwater lakes) via your first pass known as Chola Pass (5420 M). Then after this arduous hike, it is all rest with a short trek to Gokyo Ri where you get to view Everest along with five other peaks. Then you hit the trail again to Lungden via Renjo La Pass (5345 M) and next day sees you onto Thame and then Namache Bazar and finally on the plane at Lukla. +ing up an easy trail and to meet up with Dudh Kosi (Milk River) via small village, Ghat (2550m). After short while from Pakding, you will cross the river and move up the valley; the trail stays close to the river valley – beautiful sight with blue pine and rhododendron forest. You again cross the Dudh Kosi River at Benkar getting glimpses of snow studded peaks of Kusum Kanguru (6369m) and Thamserku (6623m). A short walk to Monjo (2835m) gets you in time for lunch. The trek here is along flat terrain till the confluence Bhote and Dudh Kosi Rivers after which you start your steep climb at a steady space to Namche Bazaar. Here is a chance to showcase you photographic skills of Everest, Lhotse, Nuptse and Taweche initially. The trail moves to the side of the valley high above the Dudh Kosi. Here we get a really good view of the peaks of the Khumbu region such as Mount Everest, Nuptse, Lhotse and Ama Dablam. Trekking past a few villages and many tea-houses, we move down steeply to a bridge over a river at Phunki Tenga, a proper place for rest and lunch before we hit the steep climb for Tengboche dropping off just before we hit Devuche. The trail is a taxing zigzag but is rewarded with the pretty sights of rhododendron bushes, beautiful birds and mountain scenery. We trace our steps back to the first lake to climb steadily to Renjo La Pass (5345m) then continue down to via the west side of the pass till we reach Lungden – more a small collection of huts rather than a village. 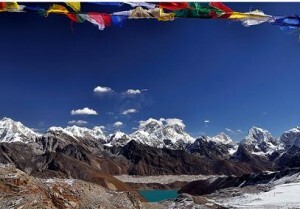 All the way we get the disappearing views of Gokyo lakes and the diminishing view of the Khumbu mountain range. We take the eastward trail to head to Thame a beautiful village on the western side of the Khumbu region which joins the Rolwaling Himalayan range. On reaching Thame we get the rest of the day to rest and explore the surrounding mountain Himalayan scenery. We trek for a while down the valley floor of the river till we cross a suspension bridge and cross to the other side all along passing some of the most dramatic scenery of the region. We come to a washed away hydro-project of the 1985. On moving to the other side, we head up a ridge then via a leveled trail marked, numerous prayer flags, mani stones and a forest at Phurte. Our legs might be a bit shaky due to the steep descent and battle against the rock terrain till the suspension bridge across the Dudh Kosi and other tributaries, after which the trail becomes more level. All levels of discomfort of the high altitude might now leave as we hit warmer climate. The view will be different even though we are retracing the same path. The view is a mixture of open plains, rhododendron and pine forests with snow in the distance. We pass a few Sherpa villages and prayer flags and prayer inscribed stones. A short walk to Ghat gets us to the Dudh Kosi rivers and follow an easy trail flat ascending trail getting and southern view of the Khumbu region. A short hike to the airport at Lukla for an early morning flight back to Kathmandu where you get to rest for the rest of the day or sightsee the capital city to buy souvenirs for people back home.